Kitty looks to see if anyone is watching. 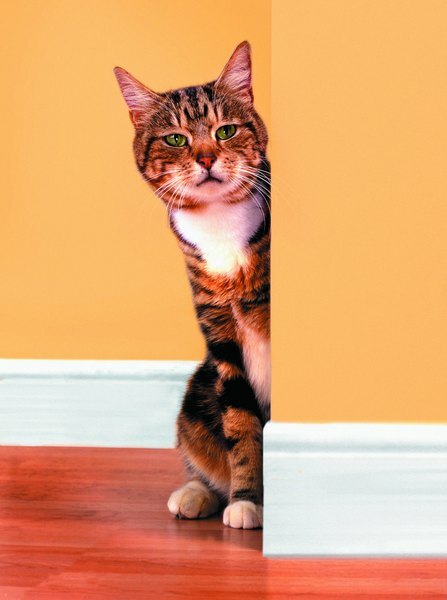 Aside from pretending they have no use for humans, other cats or that noxious thing called a dog, cats manage to find a lot of fun things to do -- especially when you aren't looking. And not with expensive cat toys, but ordinary things you have around the house. You may think she's bored, but your feline princess is actually alert and interested when she is sitting on her favorite perch in front of a window. Cats love to watch anything that moves in their realm -- from kids playing in the yard, to birds and insects flitting past, to the squirrel in the tree -- they all come under her regal scrutiny. Next time your cat is lazing away on the window sill, watch her tail. She will never let on overtly, but a quick flicking of the tail tip indicates she probably has a keen predatory interest in something outside. Never discard trash before giving the reigning feline the opportunity to play or pass. No glitter-covered ball or brilliantly dyed feather on a string holds half the entertainment value of ordinary household litter. Your cat will play hide-and-seek for hours in a paper bag -- perhaps even settling down for a nap in the new den when she tires of playing in it. Twist ties for closing bread wrappers are essential for batting practice, as are discarded balls of aluminum foil, lids from milk jugs, paper clips and similar detritus. Be aware that some of her favorites may pose a choking hazard, so never leave her alone with anything small enough to swallow. If you really want to see a cat having fun, toss a couple of ping-pong balls in an empty bathtub when she is in the room, then stand back and be prepared to duck. No international soccer star could ever match the dazzling display of athletic prowess your usually placid feline can display while attempting to kill those pesky orbs that just keep coming back no matter how hard she hits them. Warning ... this may be habit-forming play for cats, so you may have a fight on your hands when you try to reclaim the tub. If she isn't doing this already, get your couch potato off the sofa and into action with some interactive television play. Turn on a nature program about birds, insects or other cat prey, or a special video made for cats, then put Fluffy in front of the set and watch. Most cats can't tell the difference between a real bird outside the window and a videotaped bird on a screen. She will bat and smack the set endlessly trying to catch “dinner” before it gets away. You probably know first hand that this scenario also applies to the "mouse" cursor on your computer screen. Cat rules say, “if it dangles it's dead,” so humans need to pay attention. 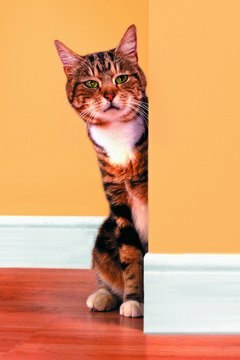 The strings from your blinds, computer cords, necklaces, tablecloths and bedspreads, another cat's tail, droopy flower arrangements -- all are fair game in the feline world. While you are at work, your cat is patrolling her territory on the lookout for offensive danglers. Don't be surprised when you come home and find blinds askew, jewelry on the floor, the tablecloth -- and everything on the table -- in a heap, and more. She may look innocent enough curled up on that cushion, but she's been busy having fun. Do Spayed Cats Eat Differently?